The argon laser had not been developed specifically for the treatment of cutaneous disease but was used mostly for spectroscopy. Most manufacturers were supplying instruments with 1 or 2 mm spot sizes with 0.1 s being the shortest pulse duration (shutter speed). Even with the "minimal dose" technique of Cosman (71,72), wherein one selected the lowest power setting to produce a visible whitening of the skin after laser impact, one had to depend on this visual signal which reflected not vascular obliteration alone but that plus coagulation of the dermis and perhaps even the epidermis with a change in light reflectance, so-called "blanching." Thus, an inside-out second-degree burn injury was produced. The necrotic collagen as well as the obliterated vessel had to be replaced by new collagen, which might end up as transparent as normal collagen or which frequently, even without excess elevation, became dense enough so that the area became opacified and lighter than normal skin color. For at least its first 12 years Leon Goldman's laboratory deemed the desirable end point of treating PWS by long-pulsed ruby laser treatment (136) as an improvement by "producing collagen damage with superficial fibrosis [to] ... change the optical quality of tissue." In other words the end point was production of scar tissue but it was not ever called so except by Brauner (75) and Schliftman concerning argon laser, who also recognized the similarity of this "opacification" to the appearance of an opaque collagen skin test in transparent skin (Figs. 1.11-1.13). Such opacification was later cited as an adverse effect by Geronemus (177) but was mistakenly thought to be hypopigmentation. It was not a reflection of total and permanent destruction of melanocytes by the argon laser since these areas did tan in sunlight and even hyperpigmented without sun but represented a true scar. As a typical example, in a large review as late as 1986, Apfelberg and McBurney (60) cited a 14% incidence of "scarring" in port-wine stains treated by argon laser with a variety of parameters and a 35% risk in strawberry hemangiomas. 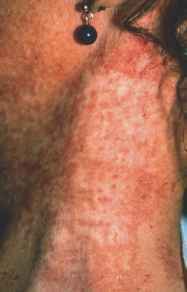 Nevertheless, photodocumentation of their results, even those reported as good results, clearly showed scars, but these were mischaracterized as not only "no change in sebaceous skin" but also exhibiting mild scarring in nasal telangiectases, "flattening and blanching... of strawberry mark" but with a densely opaque and hypertrophic lip scar, "lightening" but with a dense slightly hypertrophic scar on a treated tattoo, "without scarring" of a pyogenic granuloma which does have a small hypertrophic scar, "resolution of trichoepithelioma"
Figure 1.11 Flat opaque scars after argon laser surgery and appropriate dressing. Figure 1.12 Almost invisible opacification of an argon laser test area. 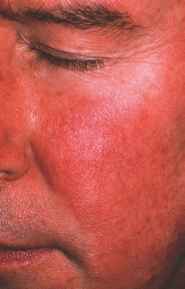 Figure 1.13 Same area after stretching, exhibiting flat opacification and not true hypo-pigmentation. turned out to be. Time and time again, even with photographic documentation showing scarring, authors mentioned only improvement of the primary lesion and left it up to the reader to deduce that scarring was more prevalent than reported. 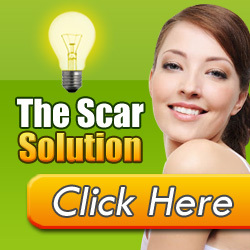 A variety of methods were attempted to minimize hypertrophic scarring. Apfelberg tried to treat only small areas assuming that a larger second-degree burn injury would be more likely to hypertrophy. He spaced his treated areas with parallel untreated areas in a "banded" or "striped" pattern but eventually discarded the technique since scars continued to appear (73,178,179) (Fig. 1.14). Cosman tried to minimize the amount of thermal damage by using the lowest possible power setting to be effective. Unfortunately, the visible end point used in port-wine stains without magnification was not watching the vessel disappear or coagulate but watching the dermis and epidermis coagulate. 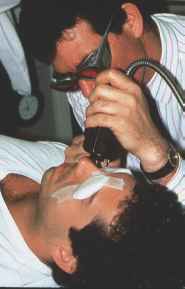 With this minimal dose technique, Cosman used the lowest power setting to produce discrete whiteness of the epidermis after laser impact for each individual patient and used that dose uniquely for the patient with 0.2 s bursts. Many surgeons, including Cosman, used the dot-by-dot intermittent technique with slight or no overlap of the 1 or 2 mm bursts to produce uniform as well as reproducible injury. Scheibner and Wheeland (180,181) used the continuous wave tunable dye laser tuned to 577 nm with magnification by 8-power optical loupes to trace out vessels and observe them constrict and coagulate as the visual end point. Tracing was done in a continuous fashion but with the surgeon's hand moving quickly. This meticulous and incredibly laborious method was thus more sparing of the epidermis and the dermis surrounding the vessels. Since the minimal achievable pulse duration was 50-100 ms scanners were developed (182) which could move a beam so quickly over an area that the effective time of injury was 1 ms and much more focal to the vessel (183,184). 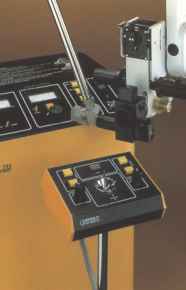 Scanners were also developed for use in gynecologic surgery and by 1982 for the cutaneous CO2 laser with a microslad coupled to the Sharplan 733 laser (Fig. 1.15) and later a Sharplan 777 scanner; these scanners were not used primarily for vascular lesions but for more precise vaporization of large areas such as tattoos and for resurfacing of scarring from acne, varicella, or trauma and other contour defects such as rhytids. Robotized hexagonal scanners were introduced by Rottoleur et al. (185) in 1988 initially for use with the argon laser, but later they were used with continuous wave dye and copper vapor lasers (Fig. 1.16) which had appeared commercially. The release of pulsed dye lasers for vascular and pigmented lesions dimmed the aura and popularity of hexagonal scanners (186) but scanners appeared again in the mid-1990s as adjuncts for laser resurfacing with carbon dioxide and Er:YAG lasers. Figure 1.14 Hypertrophic scarring after argon laser "stripe" technique and an undressed wound. slow down and pool targeted erythrocytes in port-wine stains and not to diminish burn injury. Unfortunately, no pooling was statistically demonstrable and the main "benefit" was a lower incidence of atrophic scarring, scarring which could just as well have been caused by lack of closed dressings. Even intraoperative chilling (188-191) was attempted in the hope of preserving the epidermis so that there would be no open wound to become potentially infected and to preserve the upper papillary dermis. Since an inside-out thermal injury was produced by the laser, a lower set temperature point for the epidermis meant that the temperature rise from spread of heat from the injured vessel would still be below a necrosis threshold of 70°C (9). Chess (190,191) has promulgated for years the importance of intraoperative chilling for a variety of lasers and invented the first practical "icing" device. Landthaler (189) had used an ice cube to chill the epidermis as he moved his deeply burning continuous Nd:YAG for hemangiomas. Leon Goldman (188) had toyed with a variety of unusual chilling implements in his laboratory. A deeper understanding of the thermokinetics of laser injury has led to resurgent interest in chilling in the late 1990s for maximal thermal injury to targets such as deeper or larger telangiectases (192) and venules, deeper or resistant port-wine stains (193-202), and the hair follicle. A concurrent approach to greater selectivity of the laser for its target in the mid- to late-1980s centered on the greater relative absorption by oxyhemoglobin than melanin of yellow wavelengths (203). The argon-laser-pumped continuous tunable dye laser tuned to 577 nm (204), the quasi-continuous copper vapor laser (205-210) at 578 nm, and the pulsed dye laser at 577 nm, had better absorption and deeper penetration so that theoretically deeper vessels could be targeted and more energy could be delivered to destroy vessels with less or no epidermal injury. The continuous dye and copper vapor were both found to be somewhat more effective than the blue-green argon but their clinical thermal effect was essentially unchanged from the argon experience (206) whether made freehand or by scanner. They were followed shortly in the cutaneous surgical marketplace by the quasi-continuous copper bromide laser (211,212) and the quasi-continuous krypton laser (7). Interestingly, the pulsed dye laser was shifted to 585 nm, which is less well absorbed than 577 nm, and now is also used at 595 nm (213).